Say the word “Monopoly” to most die-hard gamers and they are likely to run screaming from the room as if their face is engulfed in flames. To some gamers, that very flaming fate would be preferable to the tedious, near-death experience of another game of Monopoly. To those of you who cringe at the thought of Passing Go; to those who abhor little metal Scotties; to the dear few who pray you Go to Jail so you don’t have to sweat bullets trying to get past your cousin’s stupid Skid Row with hotels on them – I’m here to tell you that it’s safe to come out from behind your stack of Eurogames. I’m going to perform a miracle: I’m going to show you that Monopoly can be fun again. 1) Place a property in front of you. You now own this property – but probably not for long. We’ll get to that. 2) Put money into your bank by placing a money card in front of you, into a stack that you form beside your expanding property empire. This money is used to pay other players when they play certain cards like a bunch of dirty money grubbers. 3) Play an Action card. This is as easy as placing the card into the center of the table and announcing, smugly, “You now have to give me lots of money/give me a property/give me a set of of your properties.” Action cards can also be placed into a player’s bank to be used as money, but once this is done the action card can never be used again, even if it goes into an opponent’s bank. Play continues in the customary clockwise fashion with each player drawing cards and placing cards until someone manages to complete or steal three full sets of properties by any means necessary. 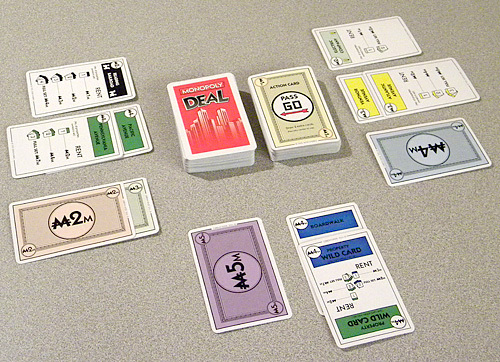 To aid each player in becoming a real estate magnate, there is a delightfully evil array of Action cards. The most basic of these cards are the Rent cards, which typically have a ring filled with two colors. If a player owns property of one of those two colors, they can play a Rent card on their turn and charge – usually – every player an amount of money indicated on the property card according to the number of cards in that set. Most times the amount is small because a player will only have one or two properties in the set, but occasionally some lucky jerk will own the dark blues and hit you for eight big ones. There are also a few Rent “wild” cards that will allow players to charge a single individual rent on property of any color that they own. This really comes in handy. 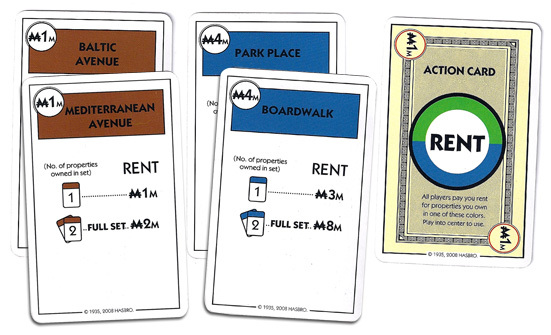 Rent can be modified by the addition of three other Action cards: Houses, Hotels and Double the Rent. Houses and Hotels work like in the boardgame, adding value to a property set. You can’t play a House until you get a complete set and you can’t play a Hotel until you own a House. Achieving this is akin to getting a royal flush in Poker. Double the Rent does exactly what it says – you play it in addition to a Rent card to double the amount owed by the table or individual player. Whenever a player charges Rent, opponents must pay up to the value indicated by any means necessary. This can be from a player’s bank of money or from properties they own. Opponents are free to choose between the two, but typically you’ll want to pay from your bank. If you’re unlucky enough to have no money in your bank, you have no choice but to hand over properties. Any properties gained in this way immediately become the property of the receiving player. Yes, you can win this way. Yes, it’s dirty. Rent is fun, but it can sometimes be unreliable; you have to own the right properties and then get the correct rent cards, so timing can be off. Luckily, there are plenty of other ways to screw over your opponents. The ever-popular It’s My Birthday! nets you 2 Mil from every player, and typically a lot of grumbles. Debt Collector lets you ask a single opponent for 5 Mil, and maybe a slug in the face. It’s a great back breaker against a player who has no money in the bank and lots of property you’ve been eyeballing for several turns. Sometimes you don’t even want to hassle with Rent or collecting wads of cash from your opponents in order to get your hands on properties. That’s when it’s time to steal. Sly Deal lets you nab one property from an opponent as long as it’s not party of a set. Similary, Forced Deal allows you to swap one of your properties for one of theirs. The real napalm of Monopoly Deal, though, is the Deal Breaker. This card allows you to steal a complete set of properties from any opponent and may get your name crossed out of a will. There are a few other various cards that help you along the way. Pass Go lets you immediately draw 2 extra cards from the draw deck. There are a lot of these, and they can help out in a jam. Just Say No allows you to cancel the effect of any Action card played against you – this can include Rent, any of the money grubbing cards, or the insidious stealers. You wanna hold onto this for when your opponent plays Deal Breaker so you can laugh in their face. There are also some “double” properties that have two colors on them which can be played as part of a set of either of those colors. In addition, there are two multi-color Property Wilds which can be used as part of any property set. From my descriptions of the mechanics and types of cards, there may seem like a lot going on under the hood in this game. This is mostly true, but deceptive – since the Monopoly theme is so carefully woven into the mechanics and titles of the cards, the game seems immediately familiar to most players. Everyone instinctively knows that the Railroads and Utliities go together, that you can get a lot of money from Boardwalk and Park Place, and that Passing Go is almost always a good thing. This sort of ingrained gaming instinct frees up a lot of processing power to quickly learn the Rent mechanic, the importance of always keeping a healthy bank of money, and when to use those Action cards at just the right time. It is also this instinctive familiarity that makes most anyone you ask to play a game answer yes, even if they have never played before. 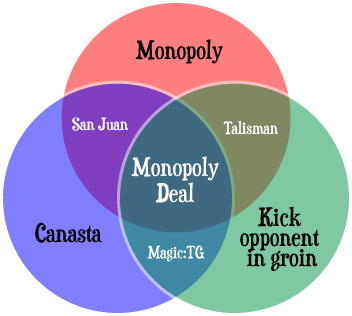 Overall, though, Monopoly Deal rises far and above its titular ancestor. Regardless of whether you ruled the real estate world or ended up eating beans out of a can in your cardboard box, you’ll fall in love with this little undiscovered gem – and you’ll never have to play as the thimble again. Despite the sometimes-lopsided victories many players can pull off, the gameplay feels balanced, especially with an optimal four or five players. Again, despite those lopsided victories, most players will want to play this game over and over and the portability sends replay value from Baltic Avenue to Boardwalk. The cards aren't going to win any awards for art - there really isn't any. But the graphic design is clean, each card is easy to read and understand, and it's a cinch to see what's in your hand at a glance. Theme is - well, it's Monopoly, which means that people will connect immediately. Take the best parts of Monopoly, toss out the decades-long playing time, mix in some meatier opportunities to really ruin your opponent's day, and you've got one helluva fun card game. Overall score: 14 out of 18 - Atlantic City should be so fun. Monopoly Deal is a card game for 2 to 5 entrepreneurs, ages 8 to Adult, and retails for like 5 or 6 bucks at almost every Target, Walgreens and roadside convenience store so, seriously, why haven’t you bought this yet? LOVE your charts – they’re hilarious!! Thank you!! I was feeling very inspired. 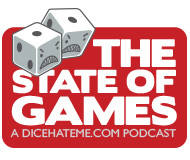 Along with that , ITA , I am not the Monopoly despiser that most gamers at my moderate intensity level are , but this is an adorable little card game and again these charts are making me glad I have taken a couple hours off my work I am doing to check a lot of things out on this site. “” shoot me now, kick opponent in groin, jerkface on dark purple hotels ” — I am going to be LMAO at this stuff ALL DAY. Bravo.